George Lowe was born in Carmyllie in Angus in 1856. The family moved to nearby Carnoustie when he was eight and, after some years caddying, he became an apprentice clubmaker with Frank Bell. He was the first person to play the 18 hole course at Carnoustie as he was the apprentice who had to make the holes when Tom Morris came to supervise the work and had the wit to bring clubs and balls with him. He worked as a clubmaker in Leven for Alex Patrick and with Tom Morris in St Andrews before becoming assistant to Tom Morris’s nephew, Jack, at Royal Liverpool. In 1885 he turns up in Pau in the French Pyrénées where he has been sent on medical advice because of a cold (I shall bear this in mind when I next have a sniffle!). He was well enough to give the local professional, M. Pascaline, a 9&8 hammering over two rounds in a challenge match and spend most days giving lessons. His first position as full professional was at Royal Lytham in 1888 and he remained here until 1905 becoming professional at St Anne’s Old Links until 1911. Lowe was responsible for the design of numerous courses in the north west of England, including Royal Birkdale. 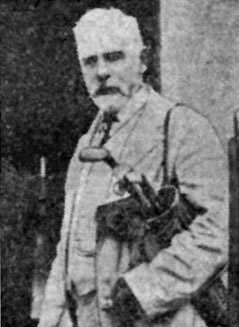 He made clubs in Hoylake for twelve years and after his wife died, emigrated to Victoria, Australia in 1920, where his two sons were already professional golfers. He was professional, at Queenscliff, for only a year but continued to teach and laid out many courses. A prolific and inventive clubmaker, he patented a set of matched clubs in 1890. In 1896 he patented the “All Hitting Face” club, keeping the face flush to the hosel, in an attempt to prevent “shanking”. George Lowe died in Victoria in 1934.